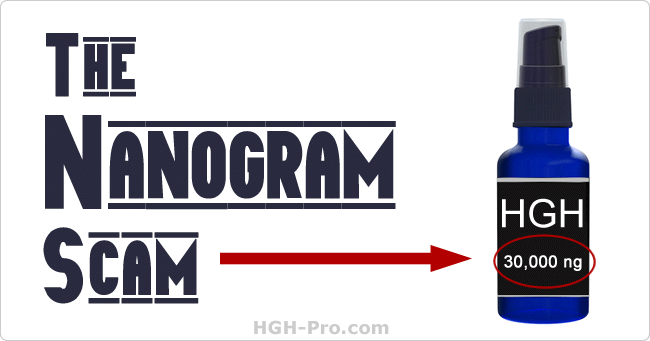 The HGH Nanogram Scam | Don't Fall For It! Instead of using the proper homeopathic measurements of potency such as "30X" some who sell HGH sprays claim their product contains a certain amount of "ng" (nanograms) of human growth hormone. This is another scheme companies and/or their distributors use to try to convince you that you will receive a larger amount of HGH if you take their product. Those who make this claim must not realize just how small a nanogram is, or else they assume customers do not know. It is one billionth of a gram, and is so small that you never see "ng" on medicine bottles. To give you an idea of just how ridiculous their claim is, one low dose of HGH injection is 1 IU (international unit), this is equivalent to about 300,000 nanograms, so even if they were telling the truth, what good could a bottle that contains a total of 30,000 ng do? You cannot take their entire bottle under the tongue in one dose, and even if you could you would still be 270,000 nanograms short of just one therapeutic dose! Of course this does not take into account the important fact that the human growth hormone molecules in their pharmaceutical state are too large to be absorbed under the tongue or in the mouth so no matter how many nanograms their product contained it could not be absorbed! False Claims about "special delivery systems". Also, once again, if their product did contain more than homeopathic amounts of human growth hormone they could not sell it because it would require a prescription. Properly made homeopathic products are very effective so I don't understand why these sellers/companies don't educate their customers about homeopathy rather than claiming their product is something it is not. Since I just stated that the HGH molecule is too large to be absorbed under the tongue you may now be asking this question: "if HGH cannot be absorbed under the tongue how can homeopathic sprays be effective?" Please see these pages for more information. If a product has been proven to increase human growth hormone in the body with legitimate IGF-1 clinical studies that measure the increase of HGH in the blood, then that product is effective, so why are these sellers making such a big deal about nanograms? The reason is because their products have had no legitimate IGF-1 clinical studies to prove effectiveness, and so they must try to make their products desirable to customers in other ways. Very few of the HGH products on the market today have had legitimate double-blind placebo blood IGF-1 clinical studies.